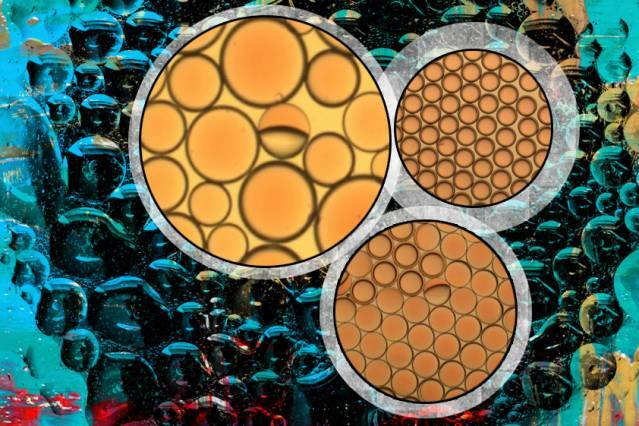 This work was recently published in Nature under the title: Dynamically reconfigurable complex emulsions via tunable interfacial tensions – one of those impenetrable descriptions, but don’t let that put you off! A complex emulsion can be made with a microfluidic device that squeezes bubbles of oil into droplets of water, which, in turn float in a stream of oil; but this only works well for small-scale production. Lauren, Vishnu and the team set out to find a simple way to create larger volumes of this type of complex emulsion, with precise control over the composition of the resultant droplets. To do this they devised a two-step process. The first step is dependent on combining two liquid hydrocarbons that are only miscible above a certain temperature; in this case, hexane and perfluorohexane. When heated above 23ºC, the liquids will mix and form an emulsion when water is added. On cooling, the hexane and perfluorohexane inside each droplet separate and a complex emulsion is created. The second step involves adding a mixture of surfactants, which alter the interfacial tension between the two hydrocarbons and the water. These surfactants engage in a tug of war, where one pulls on the perfluorohexane-water interface and another pulls on the hexane-water interface. Vishnu said: “By playing with the relative quantities of these two surfactants, we were able to directly control the relative strengths of the two interfacial tensions. “And the interplay between that, depending on which interfacial tension is larger and which is smaller, forces the droplet to take a specific configuration. This allows us to control which liquid is exposed and which is hidden inside the droplet. The use of complex emulsions offers tremendous possibilities. That’s why I find this research so exciting. It’s also a great example of multidisciplinary collaboration. Chemical engineering matters, but it’s the combination with chemistry that makes the difference here. If your work is making a difference, why not get in touch and share your story. Collaborative development programmes frequenty lead to interesting results such as this. Collaborations therefore needs to be encouraged as much as possible.